Trump has repeatedly said the US should have grabbed Iraqi oil to help fund its war effort. THE UNITED STATES is not about to plunder Iraq’s petroleum reserves, Defence Secretary Jim Mattis, who arrived in Baghdad today, said as he sought to soothe partners rattled by remarks President Donald Trump made. Trump has repeatedly said both while campaigning and since his election that America, whose troops occupied Iraq for eight years, should have grabbed Iraqi oil to help fund its war effort and to deprive the Islamic State group of a vital revenue source. But Mattis, a retired Marine general who commanded troops during the 2003 invasion of Iraq, appeared to nix the idea. “All of us in America have generally paid for gas and oil all along, and I am sure that we will continue to do so in the future,” Mattis told reporters at the start of a visit to Iraq. “We are not in Iraq to seize anybody’s oil,” he said. While speaking at the CIA headquarters last month, Trump cited the adage, “To the victor belong the spoils,” and said America “should have kept the oil” after pulling most of its troops out of the country under his predecessor Barack Obama. The president then added, without elaborating, that “maybe we’ll have another chance”. Mattis has emerged as a vital statesman for the Trump administration and has spent the past week in Europe and the Gulf on a mission to reassure allies that America is not about to abandon old military alliances. Trump also despatched Secretary of State Rex Tillerson and Vice President Mike Pence to Europe in a bid to show “unwavering” US support to NATO. 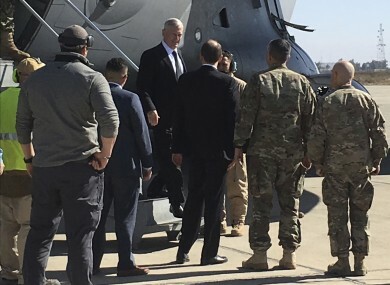 The Pentagon chief was due to meet with Iraqi Prime Minister Haider al-Abadi and Defence Minister Irfan al-Hayali, and his visit comes as the battle to recapture west Mosul from IS gets under way. Adding to the friction from Trump’s oil comments is his executive order blocking Iraqis from travelling to the United States, part of a decision to stop people from seven Muslim-majority countries from entering America for at least 90 days. The move drew immediate international condemnation and prompted the Pentagon to lobby for special consideration of Iraqis who had supported US troops, such as translators and support staff. After a federal judge blocked Trump’s travel ban, the White House is planning a new order this week that would tweak it to circumvent the court. Mattis said he had not seen the new executive order but was confident it would cater to the Iraqis who had served alongside US forces. “I right now am assured that we will take steps, allow those who have fought alongside us for example to be allowed into the United States,” he said. Email “'We're not here for your oil': US Defense Secretary tells Iraq ”. Feedback on “'We're not here for your oil': US Defense Secretary tells Iraq ”.